HOUSTON, Texas — Four members of the hyperviolent transnational criminal gang known as MS-13 hacked a Houston Police Department confidential informant to death with a machete, investigators stated. The alleged murder occurred on the night of June 6, 2018, in a Houston public park. Court records obtained by Breitbart Texas from Harris County District Clerk Chris Daniel’s official website indicate the four MS-13 members took turns hacking 25-year-old Victor Castro Martinez to death with a machete-type weapon. Martinez was wearing a surveillance recording device for the Houston Police Department at the time of the murder. Houston police investigators arrested Miguel Aguilar-Ochoa, 33; Wilson J. Ventura-Mejia, 22; Marlon A. Miranda, 19; and Carlos Elias Henriquez-Torres, 18, and charged them in connection with the murder of the informant. All four of the suspects are reported to be MS-13 members born in El Salvador. On June 6, Martinez notified a Houston police officer that an MS-13 member contacted him and was coming over to his apartment to meet with another gangster. He referred to the two members as “Chinki” and “Darki,” the criminal complaint states. The officer observed and photographed three MS-13 members known as Chinki, “Discreto,” and “Kalin” as they entered the informant’s apartment at about 1:20 p.m.
After a few hours, the informant left his house and met with the officer. He identified the MS-13 members from the photographs taken by the officer. The officer then provided Martinez with a recording device. Another officer said he had previous contact with Kalin and that he was a suspect in a murder investigation. The officers observed Kalin arriving back at Martinez’s apartment at about 8 p.m. About a half-hour later, the officer observed Martinez leaving the complex in a car with multiple people inside. About 10:15 p.m., the officer received a text message from Martinez showing his location at Cullen Park in Houston. The officer received no further communication from Martinez. Houston Police Department investigators set up a search of Cullen Park the following morning and found Martinez’s body. The criminal complaint states that Martinez sustained several blows to the head and neck from a machete-style weapon. The recording device was still attached to Martinez’s body. The officers listened to the device and heard Martinez talking with multiple people inside the car, the complaint states. One of the occupants told Martinez they were going to a park to “jump in” some new MS-13 members. Investigators used cell phone records and other intelligence methods to track down the suspects. An interview with a person who was at the scene of the murder said that “Callado,” Discreto, and Darki used a machete to hack Martinez multiple times until he died. Following the arrests of the suspects, the investigators identified Ventura-Mejia as Discreto; Aguilar–Ochoa as Darki; and Mirando-Moran as Chinki. Kalin was later identified by police as Henriquez-Torrez. 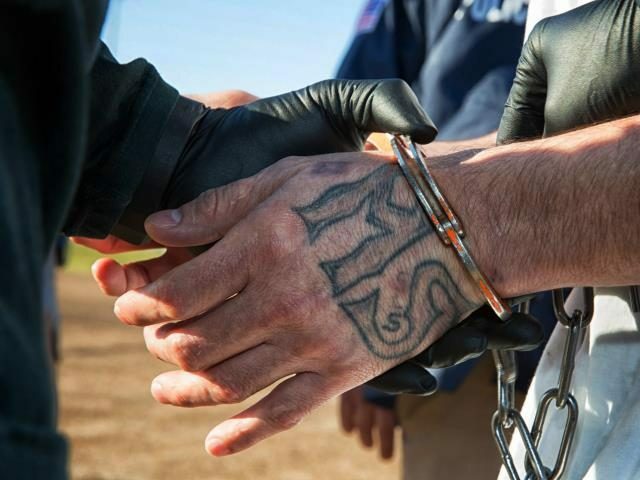 On Tuesday afternoon, Houston Police investigators announced the arrests of 11 MS-13 members in connection to five murders that occurring in Houston over the last three months. The murder of Martinez was the first of these, Click2Houston reported. The second homicide happened July 3 in Liberty County, where a man was taken to a wooded area and beaten with a bat and then hacked to death with a machete after saying he wanted to leave the gang, police said. Walter Mejia and Villalobez-Gomez were charged in connection with this case. The third homicide investigation began Aug. 1, after the body of a man was found buried in a field at 5300 W. Fuqua St. after he was killed in Galveston, police said. The fourth homicide happened Aug. 4 at La Union Restaurant at Wilcrest Drive and Bissonnet Street, where a man was gunned down in the parking lot after getting into an argument with several people, police said. Jairo Licona-Cardenas, Elida Medrano and a juvenile were charged in connection with this case. An arrest warrant has been issued for a fourth person in this case, but police would not release any other details. The fifth homicide investigation began Aug. 30, after the body of a girl was found at the same Fuqua Street location where the man’s body was found Aug. 1, police said. Investigators said the girl was not a member of the gang and had been reported missing May 4. All four of the suspects in the Martinez murders are Salvadoran nationals, according to court records.